Audubon first observed white pelicans, one of America’s largest birds, in 1808 on the Ohio River near Henderson, Kentucky. “During those delightful days of my early manhood, how often have I watched them with delight! . . . Pluming themselves, the gorged Pelicans patiently wait the return of hunger. Should one chance to gape, all, as if by sympathy, in succession open their long and broad mandibles, yawning lazily and ludicrously.” This description evokes the comical action Audubon captured in his earlier study of ca. 1831 (Figure 1), or, alternatively, the bird may be pulsating its pouch to cool itself. 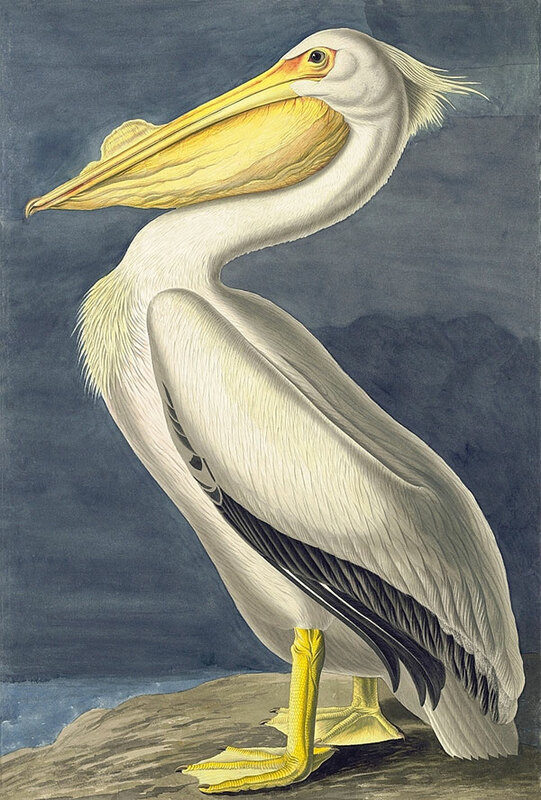 JJA painted both watercolors of the American White Pelican as nocturnal scenes in order to set in relief the bird’s white plumage. 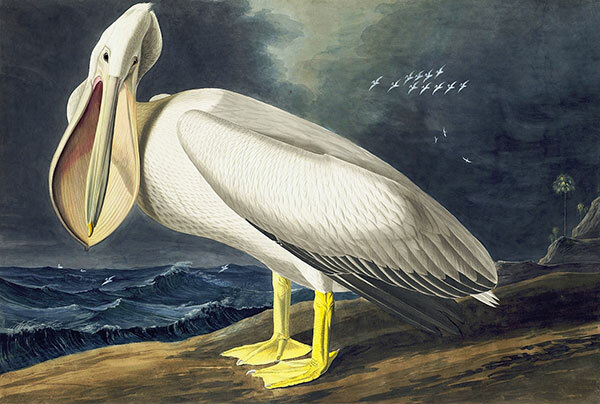 For the engraving, Audubon preferred the iconic profile view in which the texture of the pelican’s feathers and crop are more minutely described, and the gentle, easily tamed bird appears more majestic than in the radically experimental but awkwardly foreshortened earlier image. He selected as his model an adult male in breeding plumage with the characteristic excrescence on its bill. A pelican’s pouch can hold two to three times more than the bird’s stomach and may need to do so when it scoops up as much as three gallons of water containing fish. The bird’s grace in the water and air—where, thanks to its hollow bones, it is capable of sailing for long distances without flapping its wings—contrasts with its awkwardness on land.